I bought my Wavewalk in June from Steve Anderson of SOBX Kayaks. I am 76 years old and Medical issues have kept me off the water until now. I took my Wavewalk out Saturday December 27 for the first time and did five and a half miles up a very remote creek in the Pamlico River Basin. I had no problems at all with this distance and could have gone farther but daylight was running out. I would not have attempted December kayaking in my other kayak, but the Wavewalk changes all of this. I always go alone and feel completely secure in this boat! Attaching a couple of shots from Saturday taken deep in Big Flatty Marsh off of the Pamlico River in NC. I have more places than I will ever be able to visit on my list and hope to have some good shots in the months to come including some good gator shots in the summer. Thank you for these wonderful photos and inspiring review! Great review indeed, thanks for sharing. Hey, that river looks like a promising fishery! This is very productive water. 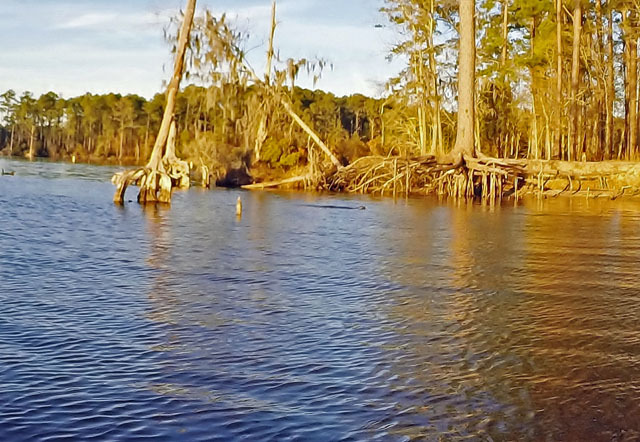 Rockfish (striped bass), Flounder, Puppy Drum, in the marsh area and Largemouth Bass, Chain Pickerel, crappie, and bream in the cypress swamp area. a great place to live! You got 4 years on me, Charlie. Us old-timers, I think, appreciate the Wavewalk more than the young pups. Just don’t let one of those NC gators crawl in with you. People in their twenties can endure pretty much anything, and get away with it. People in their thirties can still endure a lot, and sometimes get away with it. After that, most kayakers and kayak anglers tend to be more aware of kayak ergonomics, and what it means in terms of their well being and health both in the near future and in the long run. That’s when they either quit kayaking and kayak fishing, or start looking for alternatives to common kayak designs. And that’s when they start switching to W kayaks. 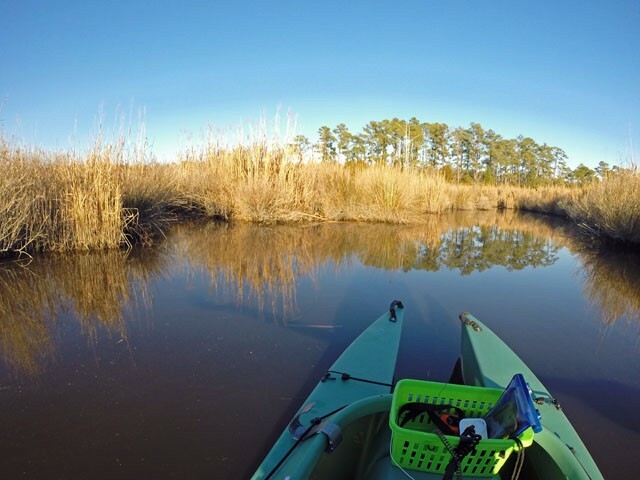 Thanks Charlie for the great review on your first trip in the Wavewalk kayak. The pictures are beautiful of your Washington, North Carolina home town waters. I will look forward to more of your reports. How’s the weather in NC??? I may be relocating to NC soon, tired of the cold and the snow up north. Thanks for the kind comments Charlie. It was a pleasure meeting you and I’m happy you are healthy and paddling. In your last picture there appears to be a critter swimming left to right in front of you. What is that? Anyone over forty looking at kayaks needs to read your comments. Hey, Rox: It’s even warmer down here in Florida. Hello Steve, The “critter” is an adult River Otter. 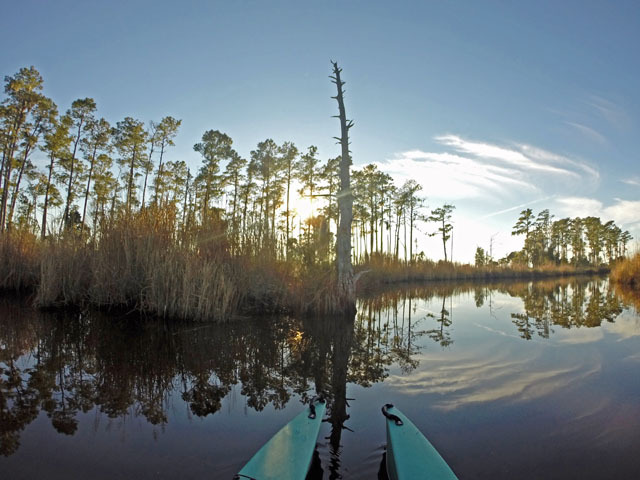 GoPro camera has some limitations as it has no zoom lens otherwise it is great for the kayak. Rox, the weather in coastal NC is usually pretty good. We did get 5″ of snow Feb. 25 but back to 62 by the 1st of March.